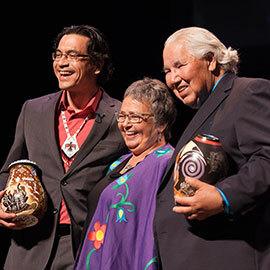 Senator Murray Sinclair, one of Canada’s first Aboriginal judges and chair of the Truth and Reconciliation Commission (TRC), challenged people to be leaders to fulfill the TRC calls to action at a special event hosted by Wilfrid Laurier University at its Brantford campus. The event, part of Laurier’s Conversations with Leaders speaker series, featured Sinclair in conversation with CBC journalist Duncan McCue. The wide-ranging discussion between McCue and Sinclair covered Sinclair’s upbringing in northern Manitoba, his legal career, his leadership of the TRC, and how these experiences influenced his own approach to leadership. “You have the right to be whoever you are in the face of outstanding pressure and you have the responsibility to be who you are in spite of that pressure,” Sinclair told the audience. Nearly 500 people attended the event, including Aboriginal community members, residential school survivors and Laurier students, alumni, faculty and staff. Blanche Hill Easton and John Elliot of She'kon Ken:tho Ya'kwes (We Are Still Here), a residential schools survivor group from Six Nations of the Grand River Territory, made a special presentation to Sinclair at the conclusion of the conversation. Video of the discussion between Sinclair and McCue will be shared on the Laurier YouTube channel in the coming weeks.